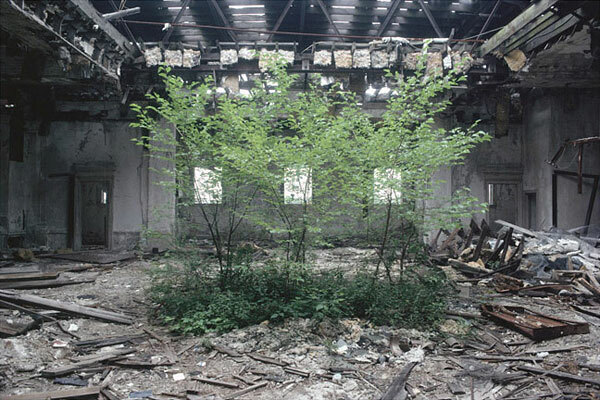 Trees on the second story of the abandoned Carnegie Library in Camden NJ. Photo: Camilo Jose Vergara. We have confidence in our science-based civilization and think it has tenure. In so doing, I think we fail to distinguish between the life-span of civilizations and that of our species. In fact, civilizations are ephemeral compared with species. Humans have lasted at least a million years, but there have been 30 civilizations in the past 5000 years. Humans are tough and will survive; civilizations are fragile. It seems clear to me that we are not evolving in intelligence, not becoming true Homo sapiens. Indeed there is little evidence that our individual intelligence has improved through the 5000 years of recorded history. Over the years these proposals have been in different forms; create a book, set of books, stone tablets, micro-etched metal disk, or a constantly updated wiki. I really like the idea of creating such a record, in fact the Rosetta Disk project was our first effort in this direction. These Doomsday Manuals are a positive step in the direction of making a softer landing for a possible collapse, and the people creating them (like ourselves) are certainly out to help people. It took millennia for the world to regain the technology and levels of societal organization attained by the Romans, so maybe a book like this would help that. However it also seems that these efforts tap a romantic notion that we would all love to find something like this book from a past or otherwise alien civilization. My worry is that it also feeds off a (likely incorrect) feeling that somehow collapse might be a fun challenge to live through, and that everyone kind of wants to be the monk in A Canticle For Leibowitz or Mel Gibson in Road Warrior. My bet is that the reality of watching your civilization (and population) collapse is likely one of the worst things anyone could experience. I am also not so sure the problem is just knowing how to remake a technology. For instance after the fall of the great Egyptian, Mayan, and Roman empires we had evidence and examples of their engineering achievements all around us. But aqueducts or senate buildings are worthless without a society around them to maintain, contextualize and protect them. It is also worth pointing out that there are likely well over a billion people on earth who currently don’t interact with formal economies or technological society at all. They will be very well adapted to a post collapse world, you should find some and make friends. They will likely be far more helpful than a manual on restarting the internet, because they know how to gut a deer. In any case I thought I would create this blog post which I will try and keep updated as these proposals and efforts come to me (and hopefully come to fruition). I will also list some of the resources that I usually refer to when I get these inquiries. Please note these resources are extremely biased toward the English language, the United States and Western culture. Also note that one of the first things that comes up when creating any compendium style work is the issue of copyright. It might sound ridiculous that you might worry about copyright in a doomsday manual, but if you want to publish it and get it into peoples hands before the apocalypse, you are going to have to deal with it in some way. Please feel free to use the comments field to make suggestions and pointers and I will integrate them here as well. The Rosetta Project: A multi-millennial micro-etched disk with a record of thousands of the worlds languages. Westinghouse Time Capsules: Two time capsules (they actually coined the term for this project) by Westinghouse buried at Worlds Fair sites, one in 01939 and the other 01965 to be recovered in 5000 years. They also did the very smart thing of making a “Book of Record” and an above ground duplicate of the contents on display. The Human Document Project: A German project to create a record of humanity that will last one million years. Crypt of Civilization: A airtight chamber located at Oglethorpe University in Atlanta, Georgia. The crypt consists of preserved artifacts scheduled to be opened in the year 8113 AD. The Voyager Record: The Voyager Golden Record are phonograph records which were included aboard both Voyager spacecraft, which were launched in 1977. They contain sounds and images selected to portray the diversity of life and culture on Earth, and are intended for any intelligent extraterrestrial life form, or far future humans, who may find them. Georgia Guidestones: The four granite Guidestones are covered in inscriptions written in 8 major languages that describe the tenets of their imagined Age of Reason. (added) Immaculate Telegraphy: An Artist creates hi tech out of materials in nature. (added) The Way Things Work by David Macaulay. This is a fantastic book, but it might leave people thinking that all technology is powered by woolly mammoths and angels. The Harvard Classic‘s originally known as Dr. Elliots Five Foot Shelf are often referred to as an item that should go into a record like this. Encyclopedia Britannica People often suggest using the latest version that is now out of copyright. I believe this is the 13th edition but so far I have only found digital copies of the 11th. The Mormon Genealogical Data: This is also held in a bunker outside Salt Lake City Utah, but it might be nice to have a record of gene lines for a future civilization to better understand its past. The Top 100 Project Gutenberg books: If you are concerned with archiving works in copyright this is a great source to find texts that are free to use. The Internet Archive: An archive of complete snapshots of the web as well as thousands of books and videos. Incidentally you would also get all of our scanned page content from the Rosetta Project with this. Wikipedia: The text only version of this is actually not that large, and could be archived fairly easily. Also one of the few sources that is beginning to get filled out in many languages and is also not held under a copyright. How to field dress a deer: PDF pocket version from Penn State College of Agricultural Science (living in Northern California, I think this one will be especially handy).